Tanu Mehra, a Bengaluru homebaker, is a regular customer of Happy Hens Farm located in Perambalur, Trichy. Mehra, who buys 30 eggs weekly containing six per carton, is satisfied with the bigger size, better taste and golden yellow yolk colour. “Though priced at Rs 150 for six, these eggs low in cholesterol and rich in omega 3, protein and carotenoids are an ideal choice for cakes and cookies.” Rajat Mendhi, a Mumbai resident, is also a Happy Hens customer due to its hard-shelled eggs, which are less prone to breakage. Whether you like it boiled, poached or sunny-side up, eggs are wholesome food, but their high cholesterol content and fishy odour often put off health connoisseurs and vegetarians. Keeping this in mind, brands like Suguna Foods, Kansal Agro and Happy Hens Farm are producing odourless, low cholesterol eggs enriched with omega 3 fatty acids as part of their initiative to promote functional foods and earn big cash. The drive started with M L Kansal, a former professor in animal science from Guru Angad Dev Veterinary and Animal Sciences University in Ludhiana. After retiring in the late 1990s, he developed odourless omega 3-rich eggs, which he named Hoava Omega-3 in 2013, after a five-year research. Today, Hoava eggs priced at Rs 100 for six pieces are available at major retail outlets under his brand Kansal Agro. According to Kansal, feeding his hens flaxseed, a rich source of omega 3 fatty acids, and a combination of 12 herbs, including neem and basil leaves, helped remove the odour. Eggs low in cholesterol are also in high demand. SMK Egg Products based in Erode, Tamil Nadu, launched low cholesterol eggs, marketed as Best eggs in 2008, says L Suresh, the company’s general manager. “Today, the brand has achieved 15 per cent reduction in cholesterol compared to normal eggs by feeding hens a special herbal formulation. We have 0.6 million layer birds in our farm, which yield 0.45 million eggs per day. We keep Babcock hens for white eggs and for brown ones, we use Hyline breed,” adds Suresh. The business has been growing by about 2 per cent every year, specifically for low cholesterol eggs priced at Rs 62 for six. For Adithya Reddy, the founder of Ayur Egg in Hyderabad, a herbal mixture made with Indian gooseberry powder, turmeric, garlic and drum-stick leaves is the secret to his hens laying healthy eggs. “This formulation acts as a natural antibiotic and helps in producing odourless eggs,” Reddy says. The farm has 40,000 hens, which are kept in cages and also permitted outdoors to feed in the open. About 0.10 million eggs are laid every day. Kadaknath hens found in Madhya Pradesh’s Jhabua district lay eggs which supposedly treat headache, asthma and nephritis. Sold by S K Bajaj farm in Gurugram, the eggs are sold at Rs 120 for a pack of six. Happy Hens also rears Kadaknath, along with other three native breeds, says Manjunath, one of the founders. The brand has expanded exponentially in five years. Today, Happy Hens has 30,000 layer birds, of which 2,000 are Kadaknath. In total, 5,000 eggs are laid per day compared to only 300 per day in 2013. 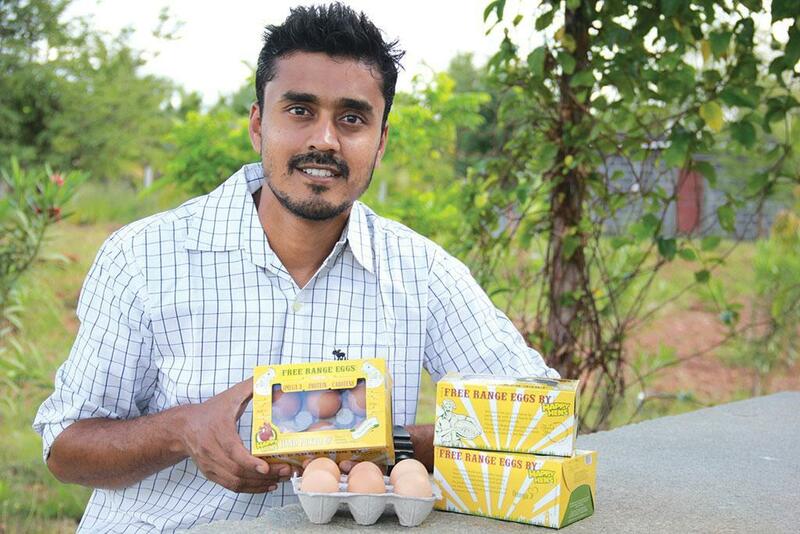 Manjunath says, “The eggs were an instant hit when we introduced them in three stores in Bengaluru in 2012. Gradually, we built our base in six cities covering more than 200 retail stores.” For Manjunath, giving farmers attractive rates is the motto. “Small family farmers engaged by us earn Rs 40,000 per month. We work closely with 20 farmers,” he adds. Though highly priced, nutrient-rich eggs have brought about positive changes in people’s lives. Sahil Bhatia, a Delhi-based pharmacist who runs his own company Maxwell, says that his hair started re-growing after consuming Hoava-3 eggs regularly. Anil Kumar Kukreja, a poultry consultant based in Delhi, used to take pain killers for psoriatic arthritis. But after he started consuming omega 3 eggs, his pain reduced within three months. Varun Goel, who specialises in dental and oral surgery at Shivam Advanced Dental Care and Implant Centre in Panipat, says, “After surgery the normal time taken for recovery of the facial fracture is over a month. But it happens faster in patients who eat Hoava.” Research shows that herbal feeds reduce cholesterol level in eggs. A study done by K Merina Devi and colleagues from G B Pant University of Agriculture and Technology, Uttarakhand, shows that cholesterol levels lessened in hens within 12 weeks of being fed on mint powder. It was published in March this year in the International Journal of Current Microbiology and Applied Sciences. Rajesh Dalal, a researcher at the department of animal nutrition in Lala Lajpat Rai University of Veterinary and Animal Sciences, Haryana, has done a research on the benefit of tumeric as a feed additive. The study published in the Journal of Pharmacognosy and Phytochemistry in April 2018 shows it improved digestion and metabolism in hens. India is the third largest egg producer after China and the US. The per capita consumption has gone up from 30 eggs to 68 per annum in the past five years, says the report, Poultry Sector: Opportunities and Challenges in India, published in 2017 by the Netherlands Enterprise Agency, Hyderabad. In such a scenario, brands selling healthy eggs are expanding. But the downside is that such eggs cater to rich consumers. Manjunath says selling at lower rates is impossible as production is not commercial. The choice lies with the consumers. “It is healthy to eat omega 3 eggs. But eating flaxseed is also an option if eggs are pricey,” says Damayanti Korrapati, a scientist at the Hyderabad-based National Institute of Nutrition. (This article was first published in the 1-15th November issue of Down to Earth under the headline 'Egg of the matter').